Taking off where I left you in my previous post, we headed to Ki monastery for a day trip, after our little hike to the Buddha statue at Rangrik. Our itinerary included heading to Kibber from Ki and calling it a day. The Ki (Also spelled Key, Kee or Kye) monastery is one of the main attractions of Spiti Valley. It is 16 Kms away, across the river from Rangrik, and 15 Kms away from Kaza. We decided to get off our vehicle and walk the last kilometer because we couldn’t get enough of the landscape. It is an isolated unique fort-monastery rested on a mountain-top. After being built in the 11th century, it has survived a turbulent history of repeated attacks by invaders, apart from fire and earthquake. It has been built several times, which is evident in many parts of the three-tiered structure. Tangyur, a fascinating room full of murals, upholds many images of Lord Buddha in diverse meditative postures. The entire monastery is surrounded by endless snowcapped mountains and deep valleys. We walked (rather trekked) around the monastery, moving between the flat-topped houses. While I was slowly scrambling about, a monk patiently waited for me to pass as he carried a large pot of food. Not only did he help me get to my destination but also invited me and my partner for lunch. Like any other polite guest, we didn’t want to trouble him and turned down his offer, but he insisted and compelled us to go to his house. He was aware that it was past lunch time and there wasn’t any restaurant or eat-outs around. The unpretentious simple meal served with so much love and hospitality allowed us to take a peek at his benevolent way of life. I was touched! Having spent a few hours at this monastery, I think I got much more than I had hoped for. Before heading to Kibber (our final destination for the day) we took a long diversion to Gette Village, 14 Kms away from Key monastery. Passing through some outlandish outlooks we reached the small village, more than 4000 meters above sea level. There are only a handful of families living here and this village is rich in limestone. It is a sedimentary rock formed over years of accumulation of skeletons of marine organisms like shells and corals. These yellowish brittle stones spread across large areas in longitudinal bands, demarcated from the rest of the brown mountains, speak tons about the history of these colossal structures. We reached the village of Kibber, situated at an altitude of 4200 mtrs. The easiest way to get here is from Key Monastery which is 7 Kms away. A heap of boxy houses is what catches your eye as soon as you enter the village. There were probably more than 50-60 houses built in the same Tibetan architectural style but with stones and bricks as opposed to mud that was used in the other villages. The village only has a monastery to offer to tourists but there’s much more a true traveler could do here. The village is surrounded by absolute pastoral muse. We stopped at the first eatery to have lunch. A small modest place, serving Indian and Tibetan food. Some fossils (found commonly around Spiti Valley) were displayed on deep wall ledges beside our table for the visitors to admire. We headed to our homestay that was rested at the far corner of the village. I was familiar with the concept of homestays but was experiencing it for the first time. And I was glad it was in this enticing commonage! As soon as we entered our interim dwelling, our host came rushing to us offering us tea and nibbles. It was a traditional Tibetan three-tiered home with a rickety wooden staircase below a low lying ceiling connecting the first and second floors. The dining room was on the ground floor framed with low rectangular wooden table tops on 3 sides, with bright colorful curtains hanging above the windows and large pillars projecting out of the ceiling. There were ornate floral decorations on the curtains and carpets. The kitchen was right beside the dining area. All their rooms had curtains instead of doors. The ground and first floor were extended to build rooms for guests which were lavish in comparison to the rest of the house, with even modern toilets and running hot water. The top floor had a dedicated prayer room where women and men assembled to chant mantras and light lamps around statues of Lord Budhha. Our evening was spent on a long walk behind the village with lush green fields that went on and on appearing to extend to infinity. It was a long road towards Chicham village. Our host at the homestay, Tenzing, warned us about staying out after it gets dark and suggested we took the bus on our way back that came to Kibber on that road. As we drifted along amidst the fields, we came across women working on the fields who tossed us a ‘Julley’ (greeting) every now and then. As the sun went down, rays gleamed on the golden mountains with dark daubs of clouds hovering above. We strolled for about 2-3 Kms through the tortuous roads passing a couple of Chortens, a few vehicles and endless mountains and gorges. We veered off the road to get on to a bridge that was visible to us. The bridge has recently become functional and leads to Chicham village. As we were getting back from the bridge, the bus roared past us and we were too far to catch the driver’s attention. We missed the bus but it was still quite bright so we continued further straight along the previous path. We reached the end of the road that turned into a gravel path ending in gorges on either side. The depth of those gorges and the enormity of the mountains enlighten you of the infinitesimal space, we as people, occupy in the universe. There’s something about it that gets you pensive and peaceful. The per diem hassles of life suddenly seem so irrelevant. Being lost in thought, we suddenly remembered that we had to head back soon. We had walked another kilometer from the bridge. We turned back and increased our pace. Just as it got dark, we reached back. Our host welcomed us back with a cheerful demeanor. We spent the rest of the chilly night on the terrace, star gazing and I was pretty sure that most city dwellers don’t even know what they’re missing! Next morning, we went trailing into the village, winding between the houses. We passed by early risers who were going about their chores. Donkeys and foals in stables looked curiously at intruders. Cattle sharing the road with us, demanded all the space as we backed down. We found our way to the monastery that turned out to be in a dilapidated condition. But hey, isn’t it all about the journey and not the destination? • Do nothing. Just be mindful. • Photography. It’s a paradise for even amateurs. 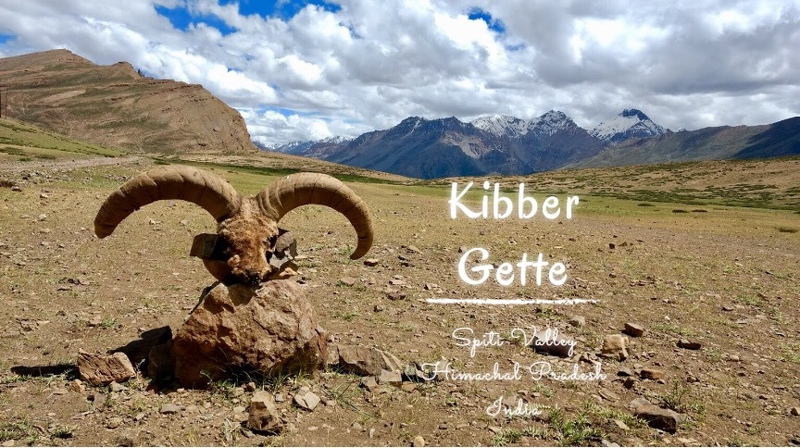 • An 8 day trek starts from Kibber to Korzok requiring permits as it takes you close to the Indo-China border. • There’s no mobile network AT ALL. • Homely food is served in the homestay. Very sparse eateries here. You are most welcome! The thought of Spiti leaves me speechless. You must visit it.